If you walk down any high street in North London at this time of year you are guaranteed to see one thing – large crates stacked high with watermelons, big, swollen and juicy. I don’t know why but whenever we buy one I always get the urge to root through the whole crate looking for the largest! Bigger is better right?! Even though there are only two of us I really have to fight the desire to cause a nuisance of myself so that I can find the biggest and best. There’s just nothing like a fresh watermelon. Fruit in salads is not a new idea. In fact I’ve already shared a few myself on this blog, including this warm fig and honey salad with mozzarella, cured ham. 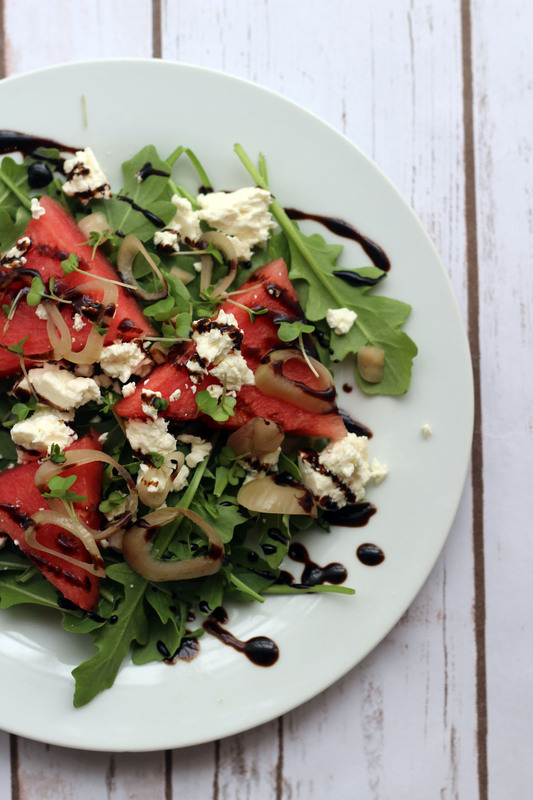 Sweet and salty works well so I chose to top the fresh, clean taste of watermelon with salty feta and sweet and sticky balsamic glaze. This salad isn’t just about the balance of flavours though, it’s also about the textures. The watermelon has it’s characteristic bite which contrasts with the soft, crumbly feta and the sticky glaze. Toss the rocket with the spring onions, slice, a little of the pickling vinegar and half of the feta. Place onto the centre of your plate. Stack the watermelon slices on the rocket before crumbling the feta on top. Drizzle with the balsamic glaze and finish with a sprinkling of cress. I’ll be the first to admit that it’s a little difficult to call this a recipe… Really this Watermelon Salad is just an assembly job, a very tasty and rather pretty assembly job… But what more do you want?! I get so lazy when it comes to cooking in the summer so this recipe is ideal for me. And I’m sure I’m not the only one who feels that way! If you’ve got any fun ways of using watermelon beyond just sinking your teeth straight into a big ol’ wedge of the stuff or building a pretty summer salad, I’d love to hear in the comments below! This is exactly what my lunch needs tomorrow! We’re having friends over and I have a beautiful watermelon that will work perfectly here! Watermelon and balsamic has me totally excited! Clearly it was meant to be Monica 😀 enjoy! This salad looks amazing and is just the perfect food for summer! Should get myself a watermelon tomorrow! Do it! You know you want to! I love the combination of watermelon and feta. This salad looks so delicious! I’m so happy it’s watermelon season! I LOVE it! Especially with some feta. This sounds great! I’ll admit I do have a sneaky slice or two while making the salad! 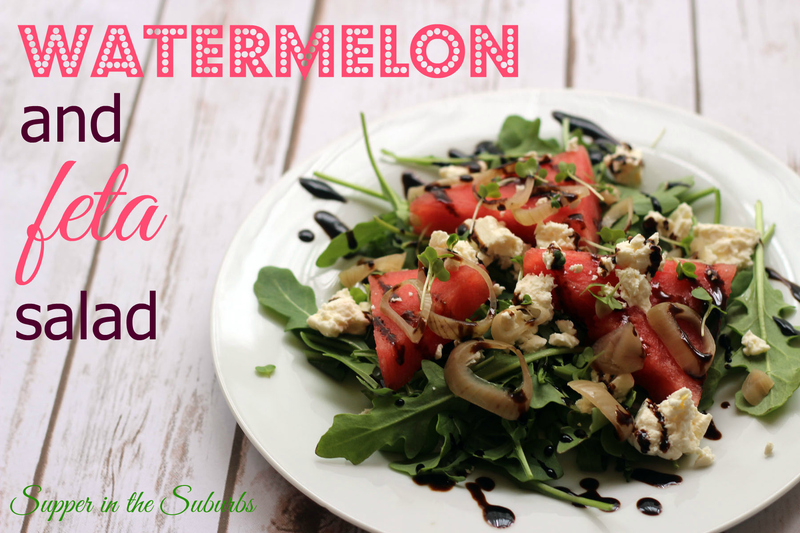 Watermelon salad is my favorite treat in the summertime! It’s so good, especially with feta and mint! I’m glad you like it Rae! It’s one of the best ways to cool off in the heat!